This plastic tank heater offers great tensile strength and resists corrosion. The compact design is perfect for locations with minimal mounting space. This model is available from 500 watt to 2000 watt for engines 150 CID to 700 CID. 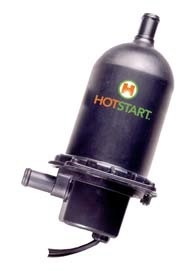 The Hotstart TPS engine pre-heater comes with a built in thermometer and heats engines up to 12L displacement. Thermosiphon circulation of the coolant delivers heat throughout the entire engine. The TPS engine pre-heater is designed to pre-heat diesel and gas engines in a generator, heavy duty mobile equipment, marine and industrial applications. If you do not see the model needed, please call us at (305)592-6800. Hotstart heaters from Americas Generators are the perfect solution for all of your engine heating requirements. They are designed and manufactured as engine pre-heaters which improve the reliability of generators engines, gas compression equipment, and all other heavy duty machinery and engines. Preheating the engines and hydraulic systems ensures that your equipment will deliver immediate full power on demand, even in the most severe conditions. Whether it’s coolant, lube oil, hydraulic oil, fuel or battery warming, Hotstart designs and manufactures engine heating products that meet exact engine specifications and unique equipment requirements.